I’ve been home sick this weekend with a sore throat and a bad cold. I’ve been getting raging headaches and have been sneezing incessantly so I haven’t been able to read anything full-length, but picture books have always made good bedside reading for me, hence this picture book roundup. I hope this flu passes soon, I’ve got a lot to read for November! An author’s signature increases the value of a book. Signed first editions, especially by famous authors, can cost an arm and a leg (the Holy Grail of the moment is a signed first edition of Harry Potter and the Philosopher’s Stone, at £8,000 to £10,000), and while there are no hard and fast rules in book valuation, a signed copy is more valuable than an identical unsigned one. For me though, the potential value of the book is secondary; the biggest thrill from getting a signed copy is being able to come into contact with the author (or illustrator) of the book, whether directly (through the rare book signings that happen in this part of the world) or indirectly (e.g. rummaging through the bargain bins and hitting paydirt!). Author SumthinbluePosted on 18 October, 2010 18 October, 2010 Categories MiscellanyTags art spiegelman, Art Spiegelman signature, author's signature, authors, autographed books, autographs, book collection, carlo vergara, Carlo Vergara signature, collection, david wiesner, David Wiesner signature, dedication, Flotsam, Ilustrado, jana kolpen, Jana Kolpen signature, Jasper Fforde, Jasper Fforde signature, Lynne Reid Banks, Lynne Reid Banks signature, Maus, meg cabot, Meg Cabot signature, Miguel Syjuco, Miguel Syjuco signature, para kay b, Princess Academy, ricky lee, Ricky Lee signature, Salman Rushdie, Salman Rushdie signature, Shannon Hale, Shannon Hale signature, signature, signed books, signed copies, The Moor's Last Sigh, valuation, zsazsa zaturnnah27 Comments on Signed! Some of my favorite book have themes of flight — The Twenty-One Balloons by William Pene du Bois; Tuesday by David Wiesner; and Peter Pan. Maybe it’s because my zodiac’s an air sign, or maybe i just like the carefree, leisurely feeling that flying themes generate. This month’s picture book roundup covers books dealing with flight, clouds, and other above-ground subject matter: The Flying Locomotive by William Pene du Bois; The Little Cloud by Eric Carle; Night of the Gargoyles by Eve Bunting, illustrated by David Wiesner; Sadako by Eleanor Coerr, illustrated by Ed Young; and The Wonderful Wizard of Oz commemorative pop-up by L. Frank Baum, engineered by Robert Sabuda. 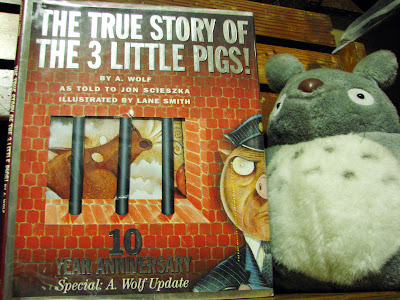 I know I just did a picture book roundup, but I’m really excited to share two picture books I got this weekend, both a deconstruction of the story of the Three Little Pigs: The True Story of the Three Little Pigs by A. Wolf as told to Jon Scieszka, illustrated by Lane Smith; and The Three Pigs (book #54 for 2009), written and illustrated by David Wiesner. 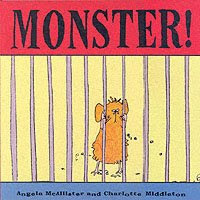 I have had a fascination for postmodern picture books since I was in college, and I have a growing collection of them. It totally revolutionizes picture books as we know them, and it’s great genius on the part of the writers and especially the illustrators. The availability of multiple readings and meanings for a variety of audiences. Now, I’ve long been a fan of Lane Smith, especially when he’s teamed up with John Scieszka, because they just make me laugh out loud! I have a growing collection of their picture books, starting with The True Story of the Three Little Pigs, The Stinky Cheese Man and Other Stories, Squids will be Squids, Cowboy and Octopus, Pinocchio, and Math Curse. I think I’m just missing a few – Science Curse, the Abe Lincoln book, and Seen Art?. I’ve had a paperback copy of The True Story of the Three Little Pigs for around 4 years now, but when I saw the hardcover, 10 year anniversary edition of the book at Book Sale for only P120, I just had to have it (never mind that I bought the paperback full price, for more than twice the amount. A. Wolf, or Alexander T. Wolf, shares his side of the story, the real story, he says, which is about a sneeze and a cup of sugar. Apparently, he was making a birthday cake for his granny when he ran out of sugar, so he went over to the pigs’ house to borrow a cup of sugar. The problem is, he had a bad cold, and when he sneezed, the first two houses – the one made of straw and the one made of sticks – collapsed on top of the their owners, and the wolf thought it would be a shame to let some perfectly good ham go to waste. The third house was brick, though, and the wolf had a nasty exchange of words with the third pig, who wouldn’t lend him a cup of sugar for his dear granny’s birthday cake. So he huffed, and he puffed… and that’s how the cops found him. 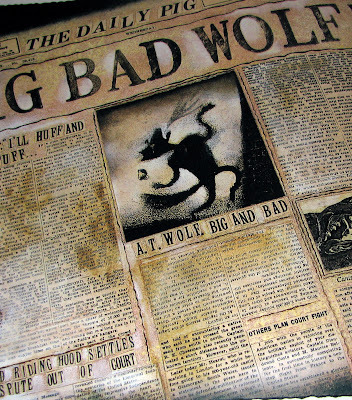 He says that the cup of sugar story wasn’t exactly breaking news, so the police jazzed up the story and he became famous as the Big Bad Wolf. Lane Smith’s rich, textured illustrations make the story doubly funny, adding little (sometimes morbid) jokes into the illustrations. 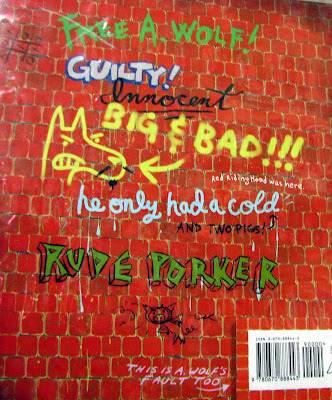 The 10 year anniversary edition, which I now have, throws in a few more laughs: there is a letter from A. Wolf complaining his ten-year imprisonment and decrying the testimony made by a certain girl in a red riding hood. The back of the book has also been vandalized with different opinions on the case. Now that I’ve “done a Blooey” on this book, i.e. upgraded yet another paperback into hardcover (in Flippers/Moochers terms), I now have a spare copy of the book (in pristine condition), but I think I already have someone in mind for the book. I’ll have to find out if that person has this already, or else it’ll go into my BookMooch inventory. By the way, I’m really loving how hardcover picture books from the US have “reinforced binding” that make them good for lots and lots of readings. Hopefully my (future + hypothetical) kids get to appreciate my growing collection of picture books, which ran out of shelves, like, several dozen books ago. I wish they’d devise the same type of binding for other types of books. 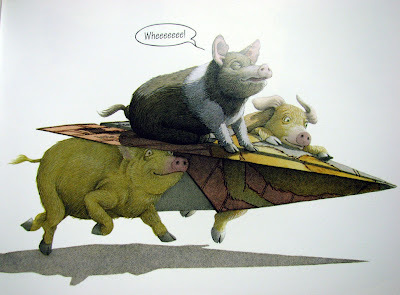 My second book for today is The Three Pigs by David Wiesner, who has fast become another one of my favorites, ever since I found a battered copy of Tuesday in a bargain bin (I think the one I mooched got lost in the mail). 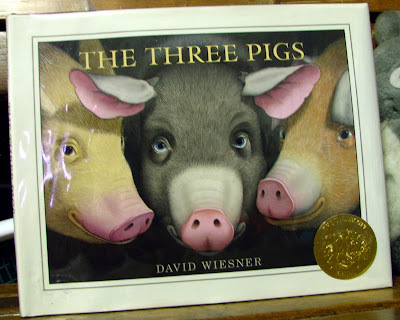 According to the jacket, “Ever since the pigs took to the air at the end of Tuesday, he [Wiesner] has wanted to give them a book of their own” – hence The Three Pigs, which received the 2001 Caldecott Medal. It amazes me how this guy just racks up the Caldecotts. Before reading this book, I’d have thought The True Story of the Three Little Pigs would be a tough act to beat, but Wiesner does a great job with this book. 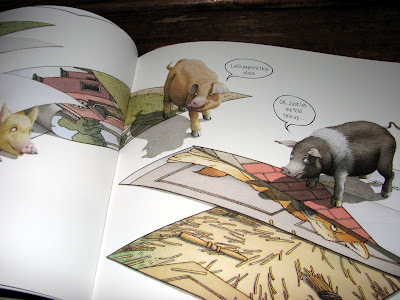 Aside from deconstructing the story, The Three Pigs deconstructs the actual structure of the book, with a touch of metafiction, as the characters become aware that they are characters in a book. It starts out as the regular Three Little Pigs story, but the wolf huffs and puffs so hard that he blows the first pig right out of the story. Confused, the wolf moves on to the next house, but as he huffs and puffs, the first pig coaxes the second one out of the story and the wolf is even more confused when he finds the second house empty. When the two pigs reach the third house, the third pig is surprised because they haven’t been eaten up. They knock away some pages of the book, fold it up, make a paper plane and have the time of their lives, until the plane crashes into a crumpled heap. The three pigs find another story and they enter it – it’s Hey Diddle Diddle. They get out of the story and the cat with the fiddle follows them out. They enter another story, this time with a dragon, and they save the dragon from getting slain by taking him out of his story. 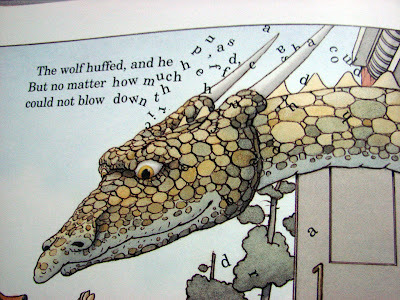 The pigs finally go home to their story, and piece it back together so that the wolf gets to the brick house, and when he huffs and puffs and is unable to blow down the house, the dragon pokes his head out and the letters from the text get scattered. The pigs decide they’ve had quite enough and leave the wolf outside while they (pigs + cat + dragon) all head inside to have some soup. I love how smart David Wiesner’s books are, and this one reminds me of one of my favorite book series, Jasper Fforde’s Thursday Next series. I like how the pigs defy the structure of the book, jumping from one story into another, ultimately taking charge of their fate. 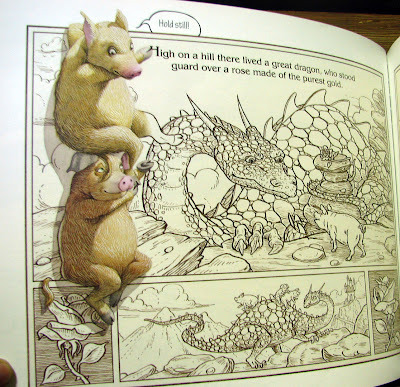 I also love how Wiesner uses different styles to establish the jump from story to story, and the pigs adapt to the illustration style wherever they are situated— from the vintage style of The Three Little Pigs, the realistic style of the “space” outside the books, the simplistic style of the nursery rhyme book, and the coloring book style of the dragon story. When the pigs are halfway out the story, they’re also illustrated in half-and-half styles. Wiesner is such a genius! I was covering them in plastic this afternoon, so I decided I might as well read and review them so I can shelve them already. 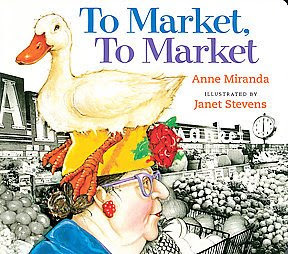 In this story, the old woman goes to the market and buys a fat pig… and also a hen, a trout, a goose, a lamb, a duck, and a goat. Chaos ensues when she brings home the animals one by one and they start to escape and make a mess around the house, and the old woman gets crankier and crankier. Finally, the old woman goes back to the market together with all the animals and buys a bunch of vegetables. Then they go home, and the old woman makes a rich, hot soup that she shares with all the animals, and they all collapse into a happy pile on the kitchen floor. I actually let out a sigh of relief at the end of the book because I was afraid she was going to cook all the animals to get rid of the racket they were making. I also liked the illustrations in the book — an interesting combination of photocopied pictures (black and white, for the backgrounds) and watercolor (full color, for the animals and the old lady), as they captured the humor of the story perfectly. I actually haven’t read the original Jumanji until today, but the movie (as well as the movie novelization) was a childhood favorite. The storybook is actually a simpler version, without the Robin Williams plotline, but most of the elements from the game are there. 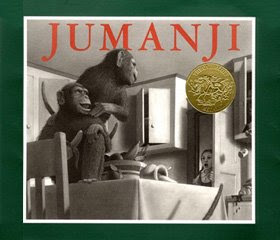 Jumanji is a Caldecott awardee, and Chris van Allsburg’s illustrations, are as always, superb. Monochromatic pencil drawings, clean lines, and masterful use of the play of light and shadow — his art never fails to awe me. Next in the lineup is Monster! a story that deals with the responsibility of keeping a pet, an issue that is close to my heart. I agree that kids need to learn this, because they often think pets are toys, and even as grown-ups some people do not take pet-keeping seriously. The story is quite effective in driving the message across. It’s about a kid named Jackson who wants a pet so badly, so his dad gets him a hamster, which he immediately names “Monster.” The hamster is a novelty, and after a week he forgets to clean Monster’s cage, and forgets to feed the hamster altogether (tsk, tsk, tsk…). One day, Monster escapes from the cage, gets into the sack of hamster feed, and grows into a real monster, and things take on a surreal reversal of roles. Jackson becomes the pet and he finds out for himself how it feels to be neglected. Thankfully, it is all a bad dream, and when he wakes up, he finds his hamster, renames him “Fluffy” and resolves to take better care of him. The illustrations in this book are interesting too, as upon closer examination, I discovered they’re actually a collage of paper cutouts outlined in dark pencil. 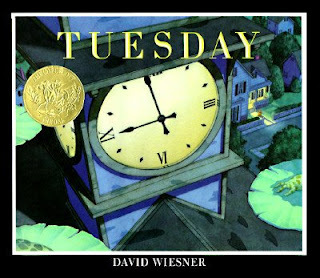 The last book in this lineup is the Caldecott awardee Tuesday by David Wiesner, which I got, hardbound for *drumroll, please* P15! All right, so it’s a library discard and a little beat up, but I don’t really care, it’s nothing a fresh plastic cover and invisible taped won’t fix. I actually mooched a copy from Israel, but it’s been some months now and I think it might have gotten lost in the mail, so this will have to do for now. It’s a book with very few words, about some very strange happenings one Tuesday night, when hundreds of frogs (what do you call them in collective anyway? Ooh, google says it’s “army”) fly into the night sky on lilypads, running into lines of laundry, inside windows, down fireplaces, past trees and dogs. The lilypads lose their flight as soon as the sun rises, and the next morning, to the townsfolk’s puzzlement, the street is littered with lilypads and some people swear they saw things zooming across the sky the night before. The story ends with a funny twist: next Tuesday, and this time, it’s the pigs that are flying. I am not fond of frogs so I was actually queasy at the sight of so many throughout the book, but it’s fascinating how each frog’s pattern is painstakingly different from the others. 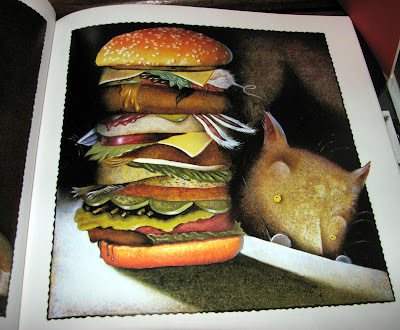 The visual narrative is awesome too — Wiesner is a master of wordless picture books. asure trove for picture book collectors.